Hobbies? Crochet is honestly my only hobby. I’m a 39-year old SAHM (who also works 20 hours per week for my church; though I am thankful to work from home). I love to read, but have never had a “real” hobby until I started to crochet. I also love music, conduct a high school choir at my church, and occasionally teach voice lessons. I have 3 kids, ages 3 – 8, and a husband with amnesia (honestly! But his sense of humor and trust in God helps us to manage) from a brain injury due to severe seizures. So I don’t have much time for hobbies. I do love to cook and bake. Crafts? None, other than crochet. Favorite Colors? Depends on what I’m using them for. I like yellow for decorating, green for clothes, and blue to make me happy. Generally, I like anything that is colorful and fun. Favorite Animal? Dogs! 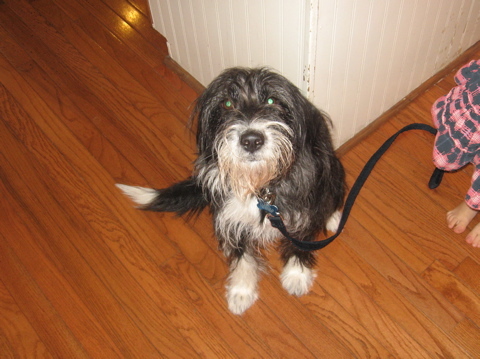 I had a Golden Retriever for 15 years, and now have a wonderful cartoon-looking Terrier mix mutt. We’ve had a bunny and gerbils, but are finally down to only one pet (the dog). But I do love all animals. All Dislikes? Beets. Bad language. Whining. Favorite Candies? Anything, esp. dark chocolate! Right now I’m really enjoying runts that I bought at our dollar store. I love marshmallows, and other really sweet things. Favorite Smell Goods? cinnamon buns. Lilac. Other things you may like or may not like? I love mugs. I don’t know why, but I collect mugs and they make me happy. I also love coffee. I like magazines, especially if they have good recipes. I have few dislikes, but don’t like perfumed body sprays, particularly if they are sweet. So that’s a little bit about me. I’m looking forward to making some online friends who also love to crochet. You are very talented. I loved seeing your ami’s. What a great idea to use Homespun! Welcome to Swap Swap Gals. Welcome to Swap Swap Gals!